Lorenzo Rey: Let me tell you something about being a leader. When a subordinate comes to question your judgment and launches a fireball in your face, it’s your duty to put him in line. Your boyfriend still hasn’t accepted that I’m the High Warlock now. Not him. If I had to break his spirit to teach him that, so be it. Alec Lightwood: Enjoy this position while it lasts. 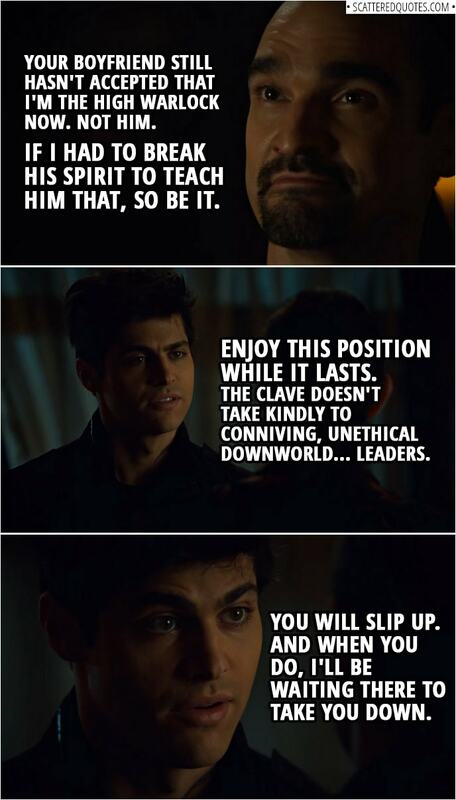 The Clave doesn’t take kindly to conniving, unethical Downworld… leaders. You will slip up. And when you do, I’ll be waiting there to take you down. 20.3.2019 I’ll be waiting there to take you down.